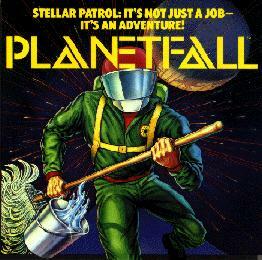 Interactive Fiction / Text Adventure Science Fiction game based in Infocom's Planetfall / Stationfall Universe. Virtual duplicate of the original transcript with added responses, objects and locations. Some bits have been changed as they were illogical and or too easy. Also many Inform style standard responses have been changed to Infocom style responses and the sidekick character has expanded AI. Type 'help' for list of Commands and Game Rules at start of the game. IF Inform Interpreters for other Operating Systems / Computers. Also try: All the ports of Windows and other Frotz, Z-Machine Interpreters and Interpreters. Infocom Stationfall Blueprints - Scientific Sub-Module Plans (Scientist's Quarters, Upper, Middle, Lower and Holding Tank Levels) and Stellar Patrol Ship Duffy, Deck Twelve. By Webmaster, David Ledgard, CSE 2 in Technical Drawing because I didn't revise before the exam. 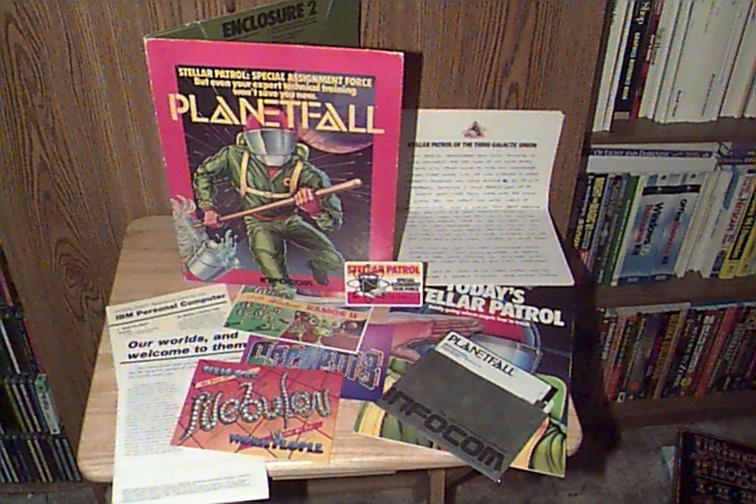 Infocom Game Manuals including Stationfall Blue Prints and Copyprotect Form. Get Planetfall and Stationfall from this server. This is how I learned to program Inform. Tutorial in 8 parts about implementing a House. "Blather loses his last vestige of patience and drags you to the Feinstein's brig. He throws you in, and the door clangs shut behind you." "Ensign Blather, his uniform immaculate, enters and notices you are away from your post. ~Twenty demerits, Ensign Seventh Class!~ bellows Blather. ~Forty if you're not back on Deck Nine in five seconds!~ He curls his face into a hideous mask of disgust at your unbelievable negligence." "Blather, adding fifty more demerits for good measure, moves off in search of more young ensigns to terrorize." "Ensign First Class Blather swaggers in. He studies your work with half-closed eyes. ~You call this polishing, Ensign Seventh Class?~ he sneers. ~We have a position for an Ensign Ninth Class in the toilet- scrubbing division, you know. Thirty demerits." De-coded using disinform 840KBytes WinZip File. Text copy of the original Infocom Stationfall Transcript SPOILERS!!!!! Don't read this until you've played the game, otherwise it will give some of the puzzles away. Unless of course you've never played Interactive Fiction before and then you'll have to look at it and will get an idea of how it works. Which was after all what they were Written for. Try typing 'help' first in the game for a list of Commands and Game Rules. Inform 6 Computer Programming Language. Written by Mathematicians, Computer Scientists, and All-round Good Programmers. Princibly Graham Nelson an Oxford University, Mathematics Professor. i.e. Students of Mathematics and Designers. spacest2.zip Source Code (95Kbytes) WinZip file [x1 .inf, x18 .h, x1 .doc, x1 .txt] SPOILERS!!!!! ->-> classes.h - Note: class Room has attribute has light. [x15 .pas, x14 .tpu, x1 .exe] SPOILERS!!!!! Don't read this until you've completed the game. Basically writing an adventure game from scratch is more than any one person can manage particularly when you take into account the ammount of testing there is. Without an specialist programming language. Pascal Programming Language. "Elegent and Structured." I originally started programming the Science Fiction "Spacestation" the game in Pascal. This download is the final point I got to before switching to Inform and shows why it is much wiser to write adventure games using a specialist language than starting from scratch. pas_spacest.zip Pascal Version Source and Run Code (92Kbytes) WinZip File [x15 .pas, x14 .tpu, x1 .exe] SPOILERS!!!!! Decoder.pas - has useful procedures that convert string words to enumerated types. Or th other way around. Decode double words, remove the's, and convert a string to lowercase. Toggle Bit Binary 32 i.e. Letter (0-255) and 65-90 ('A'..'Z') -> ('a'..'z') with AND 32 Operation. general.pas - deals with status line, score and time, and hunger if you don't eat and find food with in so many CHRONS [See Manual]. Global.pas - holds the main game variables like room [ PLAYER IN AT THE MOMENT ], room names and doors, and sentence the parser is dealing with. Up to 8 words. Map.pas - holds descriptions for all rooms in the game and procedures for all movement commands like look, north and sit. obj.pas - holds definitions and characteristics (like attributes in Inform) of objects like heavy, wearable, and room_name. Also has the procedure for the inventory command which carries words over lines so half of it doesn't appear on the line above. obj_char.pas - responses for eat and cut commands. obj_drop.pas - deals with dropping objects including into other objects. obj_lock.pas - deals with opening, closing, locking and unlocking objects. obj_take.pas - deals with taking objects. obj_wear.pas - deals with wearing and removing objects. Parser.pas - gets words from a complete sentence up by looking for the SPACE Character (32), then calls commands and deals with each. Spooler.pas - deals with standard errors, and stops text if more than one page. Until key pressed. Types.pas - most global variables and constants are stored here including many different variable types. Also has functions to determine whether a variable is a room, object, direction or command. .tpu files are compiled versions of these libraries. Oh yeah, and DON'T - whatever you do - ring the telephone number on the ID Card that came with the Planetfall packaging. :-) I might add that the Planetfall Universe is Science Fiction, and Space Opera. Set in the Galactic Empire: "3rd Galactic Union." Screen Shot of the game being run using the PalmFrotz interpreter.